Any one with an interest in Detroit’s history and its memorable architecture will be rewarded by walking down West Hancock from Woodward to Cass. The south side of this block contains two magnificent homes reflecting the best architectural design of the late Nineteenth century. 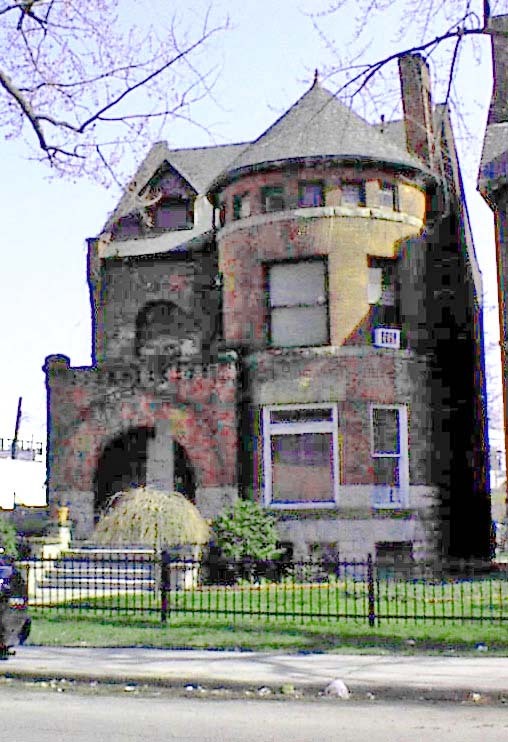 At 71 West Hancock, the stroller will see a marvelous application of the Richardson Romanesque style as adapted to a single family resident. Henry Hobson Richardson was the among the nation’s most popular and innovative architects of the late Nineteenth Century. Although the monument located in Campus Martius is the only confirmed Henry Hobson Richardson structure in the city of Detroit., his ideas are reflected in many of the city’s massive stone churches. Richardson’s approach to design influenced the architects of George Loomer’s home: Almon Varney and Lew Tuller. Note the large and imposing turret on the West Hancock front of this residence, topped by a perfectly symmetrical cone with a slate roof. The arhed entryway is recessed and, as was the style at this time, a massive stone basement protruded from the ground and raised the first floor a meter or move about ground level. George W. Loomer was a Detroit lumber dealer during the era when the city became an industrial metropolis - the 1880s and 1890. His yard was located on Woodward close to the present intersection of Woodward and Baltimore where the new Amtrak Station is locate. Use in 2010: Residence. The exterior of this home is, I believe, much as the architects designed but the interior has been converted into several apartments.